In fitness and sports, cross-training is the practice of combining exercises to work different parts of the body, and is used to avoid under or over-working certain muscle groups. In the West, fitness cross-training is associated with the popular physical or impact type exercises. So, for example, if you are a runner you might also benefit from lifting weights. Within mixed martial arts, cross-training involves learning different martial arts systems so that you are prepared for anything in combat. I did this type of training extensively when I was younger. What is interesting is the Taoists have been cross-training for thousands of years, finding connections between movement arts, healing and ultimately meditation. 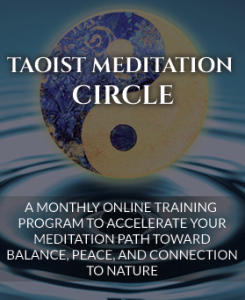 In these series of posts I want to talk about Taoist Cross-Training because it can accelerate your path in energy arts and meditation . . . The purpose of both classic Indian hatha yoga and Taoist yoga was to give a person the ability to sit for extended periods of time so that eventually when they practice meditation their body didn’t distort. So, the essence of yoga is a cross-training exercise for meditation. Both the Taoists and the Indian tradition approached yoga as a foundation for meditation, not as the main practice itself. In the West, I know a lot of people do yoga for health and fitness, much like running or aerobics, which is all good. Classically though, in the East, yoga’s key purpose was intimately linked to meditation. Now, in meditation the body should not lean to the left or the right because this interrupts the energy channels of the body. This then interrupts the flow of energy or chi (prana in the Indian tradition), which also is not often talked about in Western yoga classes. Your spine should be straight and not twisting all over the place. In other words – you’re balanced. Every real meditation tradition has very specific ways of teaching how these alignments are done. Learning this can not be underestimated because when a person is able to do that, the body’s in a very neutral state. Then you can focus on what your mind is doing within meditation. If your body is comfortable when you meditate it becomes dramatically easier for your mind to start going inside and inhabit your body. When the body is in a fairly balanced position the energy runs through the system normally as opposed to becoming distorted. When the body is distorted it results in all sorts of kinks that simply arise from the stress of the body. Often distortions bring up all sorts of emotional, mental and psychic discomforts or unbalancing points. The rub is many people think their meditation needs to resolve these unbalancing points, whereas the fact is if they were just sitting up straight comfortably they wouldn’t get them in the first place. If you prepare the body with yoga to sit better then you don’t have to go through all of this senseless misery. When the body is aligned properly you can more easily go into the deeper levels of the mind which is one of the points of meditation. It’s a bit like the world of today with modern computers. What you require is a stable computer or a stable platform for all your software to run on. Otherwise your programs run too slow, they freeze up, or you have impaired functionality. So, one reason to take up a yoga practice would be if you really want to get the most from your meditation. It is also a great place to learn how to breathe properly and learn about the alignments in the body in a sitting posture. The whole process of classic hatha yoga and longevity breathing yoga (Taoist Yoga) is to get the breathing going well while deepening the posture and alignments, thereby enabling your mind to completely enter your body. After your mind enters your body then you can start learning how to move your chi throughout your body. As that happens the energy channels of your body begin to open up. In Longevity Breathing Yoga, this is first done with breathing techniques. Later, you can open your body directly with chi techniques utilizing the 16 neigung. Your mind starts to have the ability to enter every place in your body. Whenever you bump into something in mediation, you are used to moving directly into it in an extremely unified fashion. All of you gets involved. So, for example, as you start going into things that relate to your emotions or your general thinking processes or your psychic sensitivities or your karma, then your entire body gets behind what you’re doing. Even when something very shocking or previously traumatizing, or even an extreme blockage starts arising in your mind, these experiences have a way of moving through your body without getting stuck somewhere. If something arises and it gets stuck somewhere, what do people often do when they sit and meditate? Well most often they squirm. They become incredibly distracted, space out and become disassociated to whatever that emotion was that was available for them to work with. Another common variation when this happens is that people feel things that may have been hidden beneath the surface of the mind, and that are incredibly destabilizing. They may start having visions that have nothing more to do with them than the fact they are encountering how their energy is blocked. As this happens delusions can occur, and though all of this process is beneficial, they’re not encountering and seeing genuine blockages. These are simply sideshows to the main event. Not having the energies move through the system naturally is a classic cause of people getting sick and of people becoming mentally unstable. I know that there were times when I did my first really intensive pranayama in India where this occurred to me. At that time I hadn’t been taught about how, if you’re really doing chi (qi) work, how you should look at your emotions and your mind and your psychic sphere. I was just getting all this stuff blown up inside of me. Let’s just say that I had a few emotional outbursts and at the time they were pretty rough. Once I started practicing the whole Taoist meditation method, I started getting how to make these energy flows smooth. That made the practice a lot better and it also meant that I didn’t get sick from the practices I was doing. And this same pattern I went through is quite common with lots of people who learn all sorts of energy practices without understanding this. This is also true for hatha yoga practitioners where many people will get sick from practice. They may describe it as karmic blockages and everything, but much of this is an inability to pass energy cleanly and smoothly through their body. I mean if you were constipated for a month don’t be surprised if your intestines start giving you a lot of trouble. The purpose of doing Taoist Longevity Breathing Yoga in relation to meditation is that it gives your body the ability to be balanced. It opens all sorts of things in your body from the inside that would stop you from being able to sit in a balanced fashion. Some people are able to sit in a half lotus or a full lotus. They can force their body to stay in these positions for long periods of time. Often, however, the body in these positions is very tense and causes other, larger problems. So, how do you open your insides so that your body can sit comfortably? How do you open up so that when you’re sitting properly all these postures don’t pull you apart on the inside? Let’s give some real practical examples of the importance of being relaxed rather than tense. If your tissues inside your ribs are not stretched enough on the sides, the ribs are going to cause you to stretch and tilt to one side. If the energy inside you is not moving properly through your internal organs then something might cause your spine to displace, or your neck to kink. If the chi (qi) is not moving smoothly through your armpits down your arm, then that place through your armpit through your arm will cause your body to lilt from one side to the other. All of these will then cause you to have experiences which, as you’re meditating will seem very strong, but could simply have be avoided if you first open up the energy inside your body. You don’t have to go through all of this. In fact, meditation is not a very good place to work these things out—it simply takes too long. There are better ways to do it. It’s like a person who keeps on having terrible car accidents in a wintry place because they were never taken out into a parking lot and taught how to drive on ice. It’s not a problem to drive on ice, but you do kind of have to know how to do it. In essence, if you are going to practice meditation I would encourage you to cross-train with an art such as Yoga or Qigong or Tai Chi so that you can get your breathing, alignments and posture online first. You will save yourself years of heartache. To learn more about available Energy Arts training systems, please click here. When you’re talking about how you move from your yoga practice to meditation, first you are evening out your body within all the different asana postures. The way you’re moving energy inside your body is very specifically geared towards opening up your body from the inside out. Within longevity breathing yoga you will learn internal practices used to open up your body. At each stage you will be able to open up more of your body, resolving issues that would otherwise prevent your body from becoming quiet, still and focused in meditation. The goal at the end of any practice is to enable your body to be still and focused inside itself so that you can carry this with you when you rise from meditation into daily life. Again, all of this is leading towards learning how to bring your body to a smooth and strong configuration for meditation. Many people who do more meditation than you can imagine will go on for years before they actually learn how to sit without it being a problem. In fact, I’ve met people who’ve meditated for 5, 10 or 20 years and they are still not comfortable sitting. To summarize, traditionally in hatha yoga the asanas were taught before any meditation work was taught so a person could sit comfortably. That is also the main reasons to practice Longevity Breathing Yoga, the Taoist system. So, you can see that cross-training is embedded in both hatha Yoga and Taoist yoga systems. My experience has been that it is an extremely valuable thing for people to learn some kind of system that helps with alignments, breathing and posture if they are serious about the deeper spiritual work in meditation—it enables a practitioner to leapfrog over many of the difficulties that people face when doing their meditation practice. Please click here for Part 2 in this series, and here for Part 3. I invite you to make some comments below . . .
You made me realize that I’ve been “cross-training” for years; so naturally I agree with your approach. However, I’ve been largely self-taught. Since I have never encountered physical or emotional turmoil, I’ve never found it necessary to seek guidance from any guru; maybe because my regimens have been self-paced, slow and steady. First I should note that I was born, raised and still am a Christian (I’ll tie this in in a minute). Nevertheless, in 1974 I started a daily practice of Iyengar style yoga on the island of Okinawa. This physical practice must have set me up to start TM in 1976; so I was practicing yoga and meditation daily for over 10 years when I started Zazen in 1989 (as described by monk Dogen–circa 1300). I just sit in the full-lotus posture twice daily, but I never have tried the exteme of a 7-day sesshin. In 1993 I added the practice of taiji to the cross-training mix. In my opinion taijichuan is the ultimate dynamic meditation (I haven’t really had similar results with bagua). Two years ago , I tried to meditate intensively for several months. It started very neat: it was springtime, I had gathered a breathwork technique from a sadhu and the “bottom” grease to sit in uncomfortale position for some time. After a while I could bend my legs better, my energy got stronger, I was more Tuned, I could work longer harder and more concentrated in my carpentry workshop. … but the more I got , the faster it circulated. I trapped myself in a esoterical Rollercoster. I “woke up” in late autuum, bodily and mentally exhausted, living with no gas ( thanks god I had electricity), my carpentry shop was broke . I stopped everything, and after recovering , Tai Chi found me. WhenI´m doing just the warmups for tai chi , I´m deeper inside myself , then after meditating one hour the years before. As a “younger brother” that started practicing hatha yoga with George Stobbaerts 30 years ago, and some Aikido, it is reassuring to find Taoism as the great understanding we might find in Samkhia yoga, that sort of philosophy that is behind the practice. And you find it in the Sutras of Patanjali and in the Bhagavad Gita, The knowledge is so immense that you can get outpaced. Hapilly taoist practices and a correct aproach make it all alive and a great joy to cross, if the step is given behind the previous one, without jumping(for beginners at least) but with the freedom to choose the path most suitable to you…Thank you for helping us along! Anyway is Ghandhi a reference to you? Is his non violence really non violent from your point of view? Can we socially afect our society with a direct straightforward intent or is it better to leave that to polititians?Let the trusts lead the health policy of the world forcing you with vaccins. What is it we can do? Thank you for this blog, it was interesting and a food for thought. I live in England now. The first thing, having so many multiple problems, it is very difficult to make a clear statement without seeing you. What may be the path for you is not obvious without actually viewing the problems. Any sort of cross training would be based upon the common thread that goes throughout these problems. 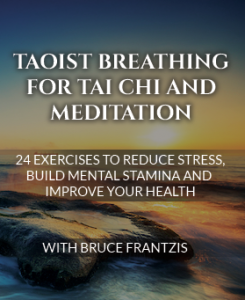 The one thing that would probably make sense for all of this is to really focus on the Taoist breathing and try to get your breathe from moving in your tantien to go to every part of your body. Whatever bad things you have, you want to have your breathe going through that part of your body, this is something that is done in Longevity Breathing Yoga.If you can get your breath and some chi moving through your body, then the path that you need to take towards any kind of cross training, considering your conditions, will be dramatically easier. 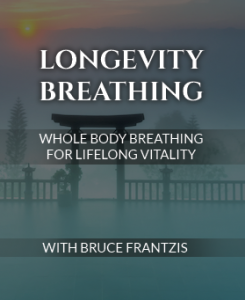 You might find it terribly valuable to come to my breathing training in Crete if it is a possibility. Given the multiple issues going on, it would take time to figure out the best path for you. If I can see you for an extended period of time at one of my trainings I will be able to assess your situation and give more specific advice. I took up both yoga and meditation many years ago and about two and a half years ago started learning your Wu style Tai Chi. When practising the Tai Chi I often feel I’d like to combine it with some yoga poses. I’ve got a book about Chinese Yoga which says that its poses are less extreme than in classic Indian yoga and this sounds interesting. To me, yoga is never a contest about who can stretch the most although it can sometimes seem to get presented in this way. I’d welcome some more teachings about Taoist yoga and also about Taoist meditation. Wonderful explanation. Through my own experience, I have found a good stretch is very useful in getting knots and stress out of my body before I do qigong and/or meditation. I have tried and looked at various yogas but their emphasis seems to be very “macho” in terms of how much stretch you can do or hold a posture. A book explaining and demonstrating the taoist yoga would be useful for all. 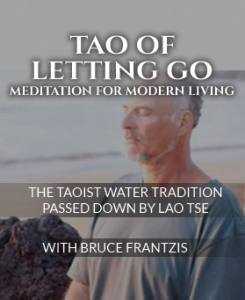 Bruce–this is a wonderful guide to how yoga and tai chi can help someone who has a meditation practice avoid some of the energy blockages that plague so many meditators I know, as they did me in my pre-tai chi years. Although I studied with an excellent zen teacher he had minimal instruction for us on how to center in our bellies and how to keep our bodies energetically balanced and open. Many of us suffered from a lot of knee and back pain as well as mental imbalances. I have read your books on the Taoist Water Method (they are among the most prized in my collection among most of your other books)…the fascinating thing is that your explanation of Taoist esoterica is identical (sometimes almost to the finest details) with the Indian systems of Samkhya (Yoga) and Advaita (both from the description of the energetics to the intellectual aspects). Hatha Yoga is simply a component of Ashtanga (8-limbs) Yoga. The 8 are, needless to say: Yama, Niyama, Asana (Hatha Yoga), Pranayama, Pratyahara, Dharana, Dhyana and Samadhi. So yes, Hatha Yoga (asana practice) and Pranayama are both preparatory to the process of Sense-withdrawal (Pratyahara), Dharana, Dhyana (meditation) and Samadhi (union with Ultimate Consciousness) (inner dissolving, if I might borrow what I have learnt from you). I am glad you have started writing this blog. Grateful for the knowledge you share. thanks for creating a blog for us. Can you comment something on the focus at the tan t’ien in Standing Meditation, as compared to the focus in yoga siting meditation where we keep it at the third eye? I’ve done Standing Meditation for years and feel very comfortable and free of body during it, and I can stand for a long duration, I feel less comfortable when sitting and more difficult to keep the focus at the third eye. This is great and has expanded my understanding of the connection between tai chi and yoga. It makes very much sense. Thankyou. Btw, your DVD’s are the most clear and easy to follow of any I have found. I live in an area where I don’t have access to attending your seminars and workshops, so I am grateful for your DVD’s, CD’s and books. Your energy is so clear and clean and filled with peace. Great blog – interesting subject. Let’s take care of one possible (but very important) typo first. The Sanskrit term prajna means “wisdom” he term prana means “energy or lifeforce.” I’m assuming that you meant prana due to its neighborly association with energy flow and chi. Terms and ideas always get complicated when we try to explain states of being and consciousness that are beyond the capability of our “normal” mind to understand or integrate. The energy channels in play during samyama (the yogic equivalent of meditation; concentration, contemplation (one-pointed flow), samadhi (“the thing itself” or unity of consciousness) are ida, pingala, and the sushumna. These are located on the left, right, and deep center of the spine. Ida (energizing thoughts and feelings) and pingala(will; intent and action) cross back and forth through the chakras from the tailbone (muladhara chakra) to the crown (Sahaswara chakra). The chakras (tailbone, sacrum, navel, heart, throat) are aligned along sushumna in the spine, then Ajna (forehead, third eye) and culminating at Sahaswara (1000 petal lotus) are the yogic path to Enlightenment, the start of Spiritual Life. The term Yoga (Union) is best defined as the state of harmony of body, mind, and inner self. This inner harmony expressed in outer harmony with the world. Unfortunately the vast majority of yoga instruction in the West focuses on the body uses techniques and practices associated with Hatha yoga. Interestingly, Hatha (literally sun/moon) yoga focuses primarily on asana and pranayama. In the classic tradition of yoga it isn’t even considered one of the four main yogas – Raja, Jnana, Karma, and Bhakti. So when sitting to meditate, get straight, breathe deep, be calm and centered, and allow your awareness to transcend (go beyond) the rational mind and experience the source of consciousness … gate gate paragate parasamgate bodhi svaha … enjoy. Thanks for the correction…this was an editor error. Thanks for taking the time to share your knowledge Bruce. It’s fantastic stuff and helps to improve lives (and make people happier)… Your website, blogs, books etc have a wealth of invaluable life-changing info in them. it really gets to the heart of my program for survivors. it’s can be difficult to explain how/why all three components (yoga/breath/meditation) complement each other to people that do not have a practice, or practice one discipline only. Ive practiced chi gung for a few years as well as the taoist meditation. Ive recently begun doing yoga (bikram) to gain more strength and flexibility. Does the Taoist Yoga that you teach give a person a similar results to hatha yoga? Or are there any other alternatives within the energy arts system? 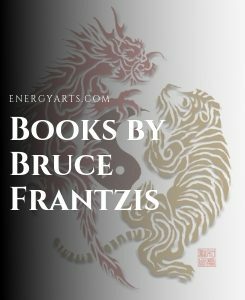 Ive been doing Dragon and Tiger Qigong for a while now and learning Energy Gates at the moment; both through your books and dvds. I love both sets but not yet noticed my flexibility improving as a result. I trying to “dig my well deep” so will likely be practicing DT and Energy Gates for a while before moving on (I live a long way from EA instructors here in Canada). I can see myself learning the energy arts system for the rest of my life. Great post, and related to something I’ve had to work out myself these past couple years. For someone coming out of the Buddhist world went very deep into sitting practice went right out of the gate and whose body started to get very cranky after the mind got quieter and things started to dissolve, what is a good place to start balancing this out? Starting to learn the Wu form has helped a bit, but what would be a good qigong to seek out? It is great to remember that yoga was intended to be used to aid in meditation. I’ve been wanting to find a yoga class or a martial arts class to help me stay in shape as well as increase my focus. I think that remember to be in the right mindset will help me achieve that.